None of us are born already knowing how to build an airplane. There are a number of ways to learn. Most builders buy their kit and dive right in, knowing that if they make a mistake, ordering replacement parts is quick and relatively cheap. For those who prefer a more formal introduction, builders classes are offered in several locations around the USA and the world. These classes are offered by usiness that specialize in helping people build airplanes as well as by organizations like the Experimental Aircraft Association, which regularly runs its SportAir workshops to help people learn the fundamentals. Classes are usually small, no more than eight or ten people. This allows the individual focus, attention and close instruction that will best meet the specific needs of participants. A typical class may last two or three days. 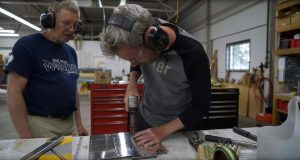 After the initial introductions and donuts (“Why exactly did you decide to do this highly intimidating thing?”), the first short sessions are usually spent describing and explaining the basic tools involved in building a metal airplane. Rivet guns, dimple dies, rivet squeezers, deburring tools and drills are fondled, explained and demonstrated. The next session usually involves a small, basic project designed to introduce the fundamentals of dealing with aluminum. Parts are measured, drilled and deburred. When these parts are fully prepared, they can be riveted together. About this time, the students begin to realize that the operations they worried about the most (usually riveting) are actually the easiest, while tasks they never considered (all the preparation work) take more time and effort than they’d imagined. After a few more small projects, each emphasizing some specific operation, the final day is spent building the “graduation project.” This phase is more involved and brings together all the new skills acquired over the last few days. A typical last-day effort might be a section of control surface, where skins, stiffeners, ribs and spars are all prepared, fitted, drilled and riveted. The end of each day is usually spent in a question and answer “debrief” period with wide ranging discussions about everything from specific building topics to aircraft history. Construction Classes are offered in the United States as well as other countries.